Maximum performance 40 KV/10 mA/400 Watt. 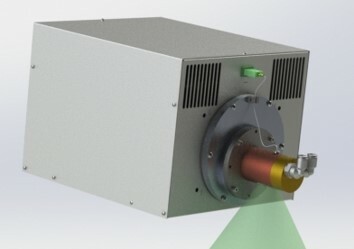 End grounded water cooled glass insert X-ray tube with 1.3 mm focal spot and inherent filtration 2 mm Al. For continuous operation. Complete X-ray source integrated into one block with control, HT generation and X-ray tube. Versatile mains input, microprocessor control with RS422 serial interface, interlocks and warning lamps output. The MB40 X-ray source is typical used for integration in high performance industrial measuring, food inspection and material analysis systems, where low cost, compact size and continuous operation are important parameters. The MB40 comes with a water cooled tube.